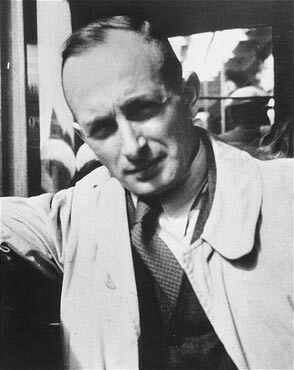 In brief - Karl Adolf Eichmann (1906-1962) headed Gestapo Department IV B4 for Jewish Affairs, serving as a self proclaimed 'Jewish specialist' and was the man responsible for keeping the trains rolling from all over Europe to death camps during the Final Solution. Eichmann was born on March 19, 1906 near Cologne, Germany, into a middle class Protestant family. His family moved to Austria following the death of young Adolf''s mother. He spent his youth in Linz, Austria, which had also been Hitler's home town. As a boy, Eichmann was teased about his looks and dark complexion and was nicknamed "the little Jew" by classmates. After failing to complete his engineering studies, Eichmann had various jobs including working as a laborer in his father's small mining company, working in sales for an electrical construction company and also worked as a travelling salesman for an American oil company. In 1932 at age 26 he joined the growing Austrian Nazi Party at the suggestion of his friend Ernst Kaltenbrunner. Eichmann then became a member of the SS and in 1934 served as an SS corporal at Dachau concentration camp. In September 1934 Eichmann found relief from the monotony of that assignment by getting a job in Heydrich's SD, the powerful SS security service. Eichmann started out as a filing clerk cataloging information about Freemasons. He was then assigned to the Jewish section which was busy collecting information on all prominent Jews. This marked the beginning of Eichmann's interest in the Jews. He studied all aspects of Jewish culture, attended Jewish meetings and often visited Jewish sections of cities while taking volumes of notes. He became familiar with the issue of Zionism, studied Hebrew and could even speak a bit of Yiddish. He gradually became the acknowledged 'Jewish specialist,' realizing this could have positive implications for his career in the SS. He soon attracted the attention of Heydrich and SS Reichsführer Heinrich Himmler who appointed Eichmann to head a newly created SD Scientific Museum of Jewish Affairs. Eichmann was then assigned to investigate possible "solutions to the Jewish question." He visited Palestine in 1937 to discuss the possibility of large scale immigration of Jews to the Middle East with Arab leaders. British authorities, however, ordered him out of the country. With the Nazi takeover of Austria in March of 1938, Eichmann was sent to Vienna where he established a Central Office for Jewish Emigration. This office had the sole authority to issue permits to Jews desperately wanting to leave Austria and became engaged in extorting wealth in return for safe passage. Nearly a hundred thousand Austrian Jews managed to leave with most turning over all their worldly possessions to Eichmann's office, a concept so successful that similar offices were established in Prague and Berlin. In 1939 Eichmann returned to Berlin where he was appointed the head of Gestapo Section IV B4 of the new Reich Main Security Office (RSHA). He was now responsible for implementation of Nazi policy toward the Jews in Germany and all occupied territories (eventually totaling 16 countries). Eichmann thus became one of the most powerful men in the Third Reich and would remain head of IV B4 for the remainder of the Reich. In July 1940 Eichmann presented his Madagascar Plan proposing to deport European Jews to the island of Madagascar, off the coast of east Africa. The plan was never implemented. Following the start of World War Two and the occupation of Poland and the Soviet Union, SS Einsatz groups murdered members of the aristocracy, professionals, clergy, political commissars, suspected saboteurs, Jewish males and anyone deemed a security threat. In Poland, which had the largest Jewish population in Europe (3.35 million) Heydrich and Eichmann ordered the Jews to be rounded up and forced into ghettos and labor camps. Inside ghettos such as Warsaw, large numbers of Jews were deliberately confined in very small areas, resulting in overcrowding and death through disease and starvation. The ghettos were chosen based on their proximity to railway junctions, pending the future "final goal" regarding the Jews. The Nazis also ordered the establishment of Jewish administrative councils within the ghettos to implement Nazi policies and decrees. "The Führer has ordered the physical extermination of the Jews," Heydrich told Eichmann, who later reported this statement during his trial after the war. Under the supervision of Eichmann, SS Einsatz groups in occupied areas of the Soviet Union now turned their full attention to the mass murder of Jews. Einsatz leaders kept highly detailed, daily records. Competitions even arose among the four main groups as to who posted the highest numbers. In the first year of the Nazi occupation of Soviet territory, over 300,000 Jews were murdered. "The unit selected would enter a village or city and order the prominent Jewish citizens to call together all Jews for the purpose of resettlement. They were requested to hand over their valuables and shortly before execution, to surrender their outer clothing. The men, women, and children were led to a place of execution, which in most cases was located next to a more deeply excavated antitank ditch. Then they were shot, kneeling or standing, and the corpses thrown into the ditch." Eichmann travelled to Minsk and witnessed Jews being killed in this manner. He then drove to Lvov where a mass execution had just occurred. During his trial after the war, Eichmann described the scene. The execution ditch had been covered over with dirt, but blood was gushing out of the ground "like a geyser" due to pressure from the bodily gasses of the deceased. SS Reichsführer Himmler also witnessed such a killing and nearly fainted. He then ordered more 'humane' methods to be found, mostly to spare his SS men the ordeal of such direct methods. The Nazis then turned their attention to gassing which had already begun on a limited scale during the euthanasia program. Mobile gas-vans were used at first. These trucks had sealed rear compartments into which the engine fumes were fed, causing death via carbon monoxide. On July 31, 1941 Heydrich was told by Göring to prepare "a general plan of the administrative material and financial measures necessary for carrying out the desired Final Solution of the Jewish question." In January 1942 Eichmann helped Heydrich organize the Wannsee Conference in Berlin during which Heydrich and Eichmann along with 15 Nazi bureaucrats planned the extermination of the entire Jewish population of Europe and the Soviet Union, estimated at 11 million persons. "Europe would be combed of Jews from east to west," Heydrich bluntly stated. Obersturmbannführer (Lt. Col.) Eichmann's sole purpose now became issues related to the Final Solution. He assumed the leading role in coordinating the deportation of Jews from every corner of Europe to existing ghettos in occupied Poland and to newly constructed gas chambers at places such as Sobibor, Chelmno, Treblinka and Auschwitz-Birkenau. At Birkenau the gas chamber disguised as a shower room could accommodate 2000 persons at a time. "The way we selected our victims was as follows," Auschwitz Kommandant Höss reported after the war: "We had two SS doctors on duty at Auschwitz to examine the incoming transports of prisoners. The prisoners would be marched by one of the doctors who would make spot decisions as they walked by. Those who were fit for work were sent into the camp. Others were sent immediately to the extermination plants. Children of tender years were invariably exterminated since by reason of their youth they were unable to work." Eichmann took a keen interest in Auschwitz from its founding and visited there on numerous occasions. He helped Höss select the site for the gas chambers, approved the use of Zyklon-B, and witnessed the extermination process. At the death camps, all belongings were taken from Jews and processed. Wedding rings, eye glasses, shoes, gold fillings, clothing and even hair shaven from women served to enrich the SS, with the proceeds funneled into secret Reichsbank accounts. With boundless enthusiasm for his task and fanatical efficiency, Eichmann travelled throughout the Reich coordinating the Final Solution, insuring a steady supply of trainloads of Jews to the killing centers of occupied Poland where the numbers tallied into the millions as the war in Europe dragged on. In March of 1944 Germany occupied its former satellite Hungary which had the last big Jewish population (725,000) in Europe. On that same day, Eichmann arrived with Gestapo "Special Section Commandos." By mid May, deportations of Jews from Hungary to Auschwitz began. Eichmann then travelled to Auschwitz to personally oversee and speed up the extermination process. By the end of June, 381,661 persons - half of the Jews in Hungary - arrived at Auschwitz-Birkenau, which went on to record its highest-ever daily numbers of persons gassed and burned. In August 1944 Eichmann reported to Himmler that approximately 4 million Jews had died in death camps and that an estimated 2 million had been killed by mobile units. By the end of 1944, the Allies were closing in on Hitler's Reich from all sides. As the Soviet Army approached Budapest, Hungary, Himmler ordered Eichmann to cease deportations. However Eichmann ignored this and had another 50,000 Hungarian Jews rounded up and forced on an eight day death march to Austria. Following the surrender of Nazi Germany in May of 1945, Eichmann was arrested and confined to an American internment camp but managed to escape because his name was not yet well known. In 1950, with the help of the SS underground, he fled to Argentina and lived under the assumed name of Ricardo Klement for ten years until Israeli Mossad agents abducted him on May 11, 1960. Eichmann went on trial in Jerusalem for crimes against the Jewish people, crimes against humanity and war crimes. During the four months of the trial over 100 witnesses testified against him. Eichmann took the stand and used the defense that he was just obeying orders. "Why me," he asked. "Why not the local policemen, thousands of them? They would have been shot if they had refused to round up the Jews for the death camps. Why not hang them for not wanting to be shot? Why me? Everybody killed the Jews." He was found guilty on all counts, sentenced to death and hanged at Ramleh Prison, May 31, 1962. A fellow Nazi reported Eichmann once said "he would leap laughing into the grave because the feeling that he had five million people on his conscience would be for him a source of extraordinary satisfaction." I. The Rise of Hitler - from unknown to dictator of Germany. II. The Triumph of Hitler - the prewar years of Nazi Germany.